Extraordinary decorative map of Long Island. The Long Island Railroad (1834 - present) is a commuter railroad servicing New York City and Long Island. Established in 1834, the LIRR, as it is commonly known, is the nation's oldest continuously operating railroad. The LIRR was initially chartered with the intention of providing service between New York and Boston via a ferry crossing at its easternmost terminus, Greenport. 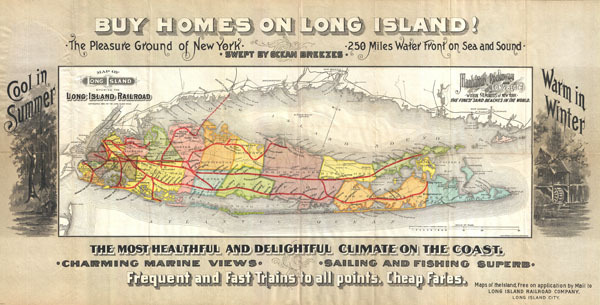 With the establishment of the New Haven - Hartford Railroad in 1849 the LIRR was forced to refocus its attention on the development rail transit in Long Island itself. Despite its best efforts the Long Island Railroad was unable to turn a profit until the company was acquired by the Pennsylvania Railroad in 1900. The Pennsylvania Rail road extended the LIRR from Long Island City into Manhattan by 1910, when it completed the innovative Penn Station at 34th Street. With direct rail access to midtown Manhattan, Long Island became a practical alternative to the rising congestion and crime evident in the rapidly industrializing New York City. Since then the LIRR has grown to become the nation's busiest railroad serving nearly 83 million passengers annually. Very good condition. Original folds exhibit some wear, especially at fold intersections, and light verso repairs.